To install Lightspeed Onsite, you must log in to OS X as an administrator. From there, you need to install both the OnSite Server and the OnSite Client. The OnSite Server is where your data resides and the OnSite Client accesses the OnSite Server's data. To use the OnSite Server on another computer, you must copy the OnSite Client to the Applications folder of the computer. During the installation, you're also prompted to change the password and create an additional administrator user account. Both these steps are important to ensure your Lightspeed system is secure but also accessible in case you password is lost. As it can take up to 48 hours for our OnSite Support team to retrieve a lost password, we recommend protecting your password with as much care as you would with your physical storefront keys. Double-click the downloaded .dmg file to open the installer. Drag the OnSite Client ("Lightspeed") to your computer's Applications folder. 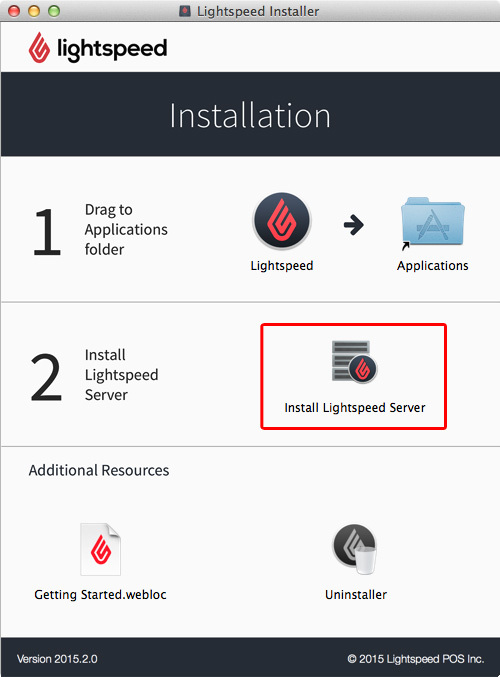 Double-click Install Lightspeed Server and follow the onscreen instructions to complete the server installation. NOTE: During the installation, you're asked whether you want to install the demo or licensed version. Choose to install a licensed version and enter your Lightspeed OnSite license key when prompted. If you’re upgrading from OnSite 2.X, this option is Migrate Database. When the installation is complete, click the Lightspeed OnSite Client ("Lightspeed") from the Applications folder to launch Lightspeed OnSite. When the login screen appears, enter your username and password and then click Connect. The default username/password is lightspeed/admin. Copy the Lightspeed OnSite Client to any client computers that will be accessing the server. Do not run the installer on client-only computers. Launch OnSite, click Servers, and then click Bonjour. Your client will detect the OnSite database on your network. Select the licensed database, enter the username and password, and then click Connect. If you want to connect to your OnSite server using a direct IP, see below. When you install OnSite Server, the installer configures your computer to ensure optimal performance with OnSite. To verify if your server computer is optimized for OnSite, or to re-optimize your computer after making changes to your system, go to Apple > System Preferences > Lightspeed Server. If required, unlock the Lightspeed Server preferences by clicking the lock icon and entering your system username and password. Click Advanced. If your computer isn't optimized for use with Lightspeed Server, click Reset Configuration. From the Apple menu, click System Preferences > Lightspeed Server. Select the database and note the port listed on the left. To allow client computers to access the Lightspeed OnSite server on your LAN, your network administrator must open this port on your router. Lightspeed OnSite is officially installed on your computer(s).